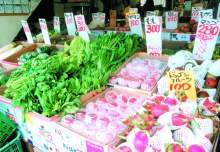 Dragon Fruit is a new product that is recently getting increasingly popular. Originally from Central America, it was brought to Okinawa a few years ago. The Dragon Fruit is actually a species of cactus. It’s shape is round and it is 13 cm in diameter on the average and purple red in color. It’s generic name is “Pitaya,” which it is called also in North America. Here in Okinawa, it is known as the “Dragon Fruit”. There are many kinds of dragon fruits; the “White Pitaya” is white inside and less juicy, while the “Red Pitaya” has dark red fleshy fruit and very juicy. The “Yellow Pitaya” is yellow outside. The dragon fruits don’t have a sweet smell like other fruits. Its taste is very simple, a bit like the Kiwi fruit, and that is hard to imagine from how it looks. Besides the fruit, its flowers and leaves are also edible when cooked. 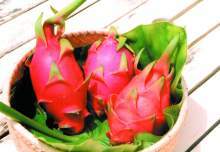 It is certain that new recipes that utilize the dragon fruit will be developed soon. It contains plenty of Vitamin-C, and water-soluble fiber that has allegedly a great effect on diet. You can buy dragon fruit at major department stores and super markets, specialty fruit stores, markets and souvenir shops. One piece costs about ¥100 to ¥800.